Ginger is a spice whose flavor is a combination of sweet and peppery. In the beginning of Zenzero’s development on my skin, ginger shows its peppery side. Zenzero starts rather spicy and dry, almost harsh; however this piquancy subsides within seconds and the ginger note become sweeter as vanilla comes into play. At this point it smells the way crystallized ginger tastes, like ginger that has been cooked in sugar syrup. Unfortunately, in no time at all, ginger practically disappears on my skin, and Zenzero becomes practically a vanilla-only scent. It is pleasant, warm, comforting, not overly foody, in fact a very nice vanilla fragrance. However, Zenzero is the name of this perfume, not Vaniglia, so I would have liked for the title note to stay around longer. I wouldn’t argue with the official description that likens Zenzero to a cashmere wrap, but I would respectfully disagree that there is anything glamorous in this fragrance. Zenzero is a very enjoyable scent, it is comforting, warm, and pretty, but nothing in it suggests glamour. It is a mystery to me, why this simple two-note comfort scent was described in these terms, but marketing people do move in mysterious ways and anyway the lack of glamour was not the reason of my disappointment with Zenzero. I cannot get over the fact that ginger note disappears completely on my skin; there already exists a very nice vanilla scent in the i Profumi di Firenze Collection, Vaniglia del Madagascar and this is what I would rather buy, should the vanilla mood strike me. For now, Talco Delicato remains my favorite in the line, a fine example of a subtly gourmand comfort scent. As for ginger, for now I will stick with my Mandragore by Annick Goutal. Any suggestions of scents with the prominent (and lasting) ginger note are most welcome! Zenzero is available exclusively at Barneys and retails for $79.00 for 1,7oz. 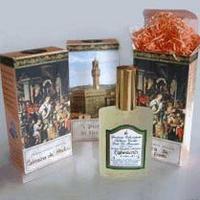 Samples of all I Profumi di Firenze scents can be purchased from Isabella Imports for $1.50 each. Our wonderful Robin sent me a sample of this fragrance, but as always, I am terribly behind! I am tempted to run and test it right now. Too bad about vanishing ginger note. On the other hand, it tends to be a top-middle note, therefore it does not last well. You might like Gimgembre from Nelli Rody, although it is only sold as part of a set. You never know, ginger might linger on your skin :-) I will definitely try Gingembre, I am also curious about some other Rody scents, thank you, V! I have never found the perfect ginger fragrance either. I like Zenzero but you are right that it is more of a vanilla than a true ginger scent. Maybe try Miller & Bertaux no. 2, although it isn't one of my favorites. Thank you for the recommendation, R! I fell in love with Miller et Bertaux # 1 a couple of day ago :-), so now I am very interested in this line. Where on earth did you find this latest icon picture - that is just perfect. K, I *think* orgins has a ginger edt or body spray or something like that, I should investigate. The pictures are here, "Deco Ladies"
I would 2nd K's rec for origins. There is( or was) an edt available. I passed it by once at the local outlet mall and have been kicking myself ever since. It was the best I tried so far. I was slightly interested in trying this when Chattykathy called it a "birthday cake candle burning" scent. I thought that sounded appealing. Now I know I will pass this one by. My favorite IPF is the amber. I also love violetta di bosco on cavewoman. It smells amazing on her. On me it smells like bitter violet leaves. The green notes cling to my skin and never leave. I would suggest Jo Malone Nutmeg and Ginger which I adore. 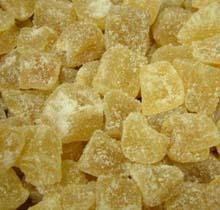 Lush also does a fragrance called ginger which has quite a strong rose note. Origins's ginger fragrance smells like ginger ale to me - there's too much sweet citrus for my taste.